The end of a baking dynasty? 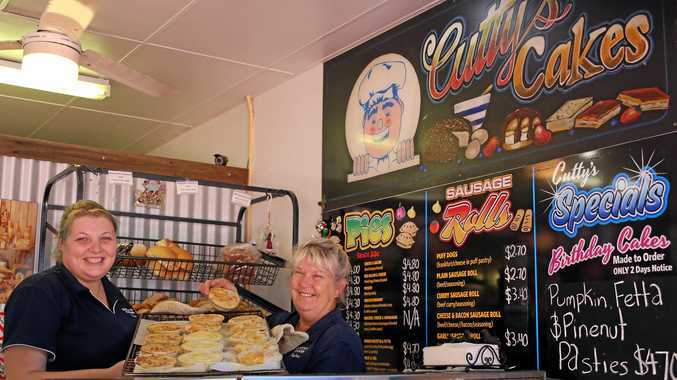 WHETHER it's a midnight muffin or a mid-morning meat pie, Cutty's Cakes in the heart of Harbour Drive has been the go-to place for baked goods for almost four decades. Many a local has hoovered down a Cutty's sausage roll or vanilla slice, or blown out the candles on one of their birthday cakes, but the time has come for the Cutmore family dynasty to hang up the baking aprons and the "for sale' is now hanging out the front of this landmark bakery. Husband and wife team, Peter and Kaylene, along with their adult children Rebecca (Bec) and Shane have been sifting flour and kneading dough for long enough and are looking forward to semi retirement, new adventures and the chance of an occasional sleep-in. "My phone nearly melted last night with people thinking we were closing,” Bec said. The smell of freshly baked treats has been wafting through the city centre for many years thanks to the Cutmore family. Peter Cutmore has been a baker since he was 15, completing his apprentice in his father's bakery, Mac's Cakes, which was located where the National Bank stands today. Eventually it was time to move out on his own and Peter opened Cutty's Cakes with his wife Kaylene. His children joined the family business as they got older and the rest is part of the Coffs Coast's tasty history. "Me and my brother Shane are also both bakers,” Bec said. It was a family decision to list the business. Those prized recipes include the secrets behind mouth-watering custard tarts, apple turnovers, potato pies and their ever popular, cheese and bacon pie. 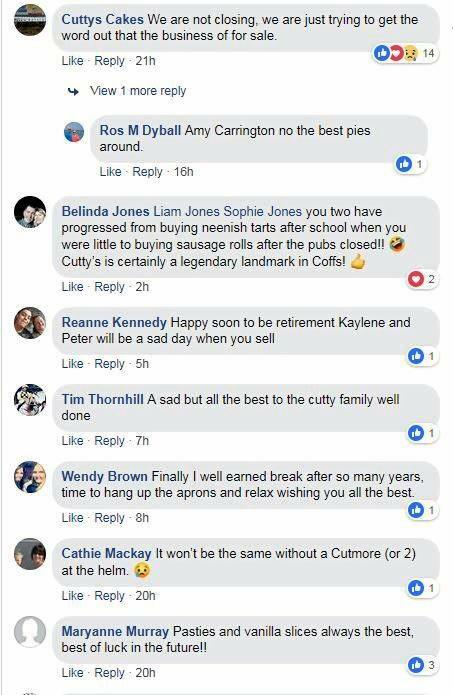 Many well wishers have taken to the Cutty's Cakes Facebook page to wish the family well in their retirement and any new ventures. The business at 86 Harbour Drive, is being offered for sale through local agent John F. Sercombe at Coffs Property Estate Agents, 6652 1788 or 0429 483 300.